Successfully Added iNew U9 Smartphone - 6 Inch Phablet, FHD Display, 4G, Dual SIM, Quad-Core CPU, 2GB RAM, 13MP Camera to your Shopping Cart. Enjoy all your favorite movies on-the-go and in stunning quality like never before. The iNew U9 phablet and its huge 6 Inch FHD display offer you the means to take your multimedia Smartphone experience to the next level. This brand new Chinese Smartphone is a large device by any standards yet very light in weight for its size – making the iNew U9 extremely portable and a perfect platform for you to enjoy all your multimedia files on. With its modern and out of the ordinary design this Smartphone is sturdy but elegant – seemingly the perfect combination. Featuring a Quad-Core CPU clocked at 1.3 GHz, 2GB of RAM, and a Mali-T720 GPU the iNew U9 Plus packs some proper horsepower. This combination of hardware allows you to enjoy all your favorite games, movies, and Apps on the telephone’s FHD 6 Inch display in full detail without dropping any frames – offering you a stunning visual experience. With 16GB of internal storage and up to 64GB of external memory running out of storage space is no longer an option. Its 3000mAh removable lithium-ion battery offers 6 hours of continuous usage time – enough for you to get through the average day and enjoy all this phone’s amazing features without having to recharge the device in the meanwhile. This Chinese Smartphone holds up to two 4G connectivity SIM cards which, thanks to its double IMEI number, can both be active and connected to different networks at the same time. With two active SIM cards you can easily separate your work and private life. From now on you will always be within reach to your contact and able to access the fastest data connectivity available on the market. Selfies, group pictures, landscape portraits, or video recording – it seems that photography with Smartphones has become even more important than making actual phone calls. The new iNew U9 Plus is deployed with the latest photography technology and is equipped with a 13MP rear camera. With this magnificent camera nothing stands between you and snapping the perfect memory. 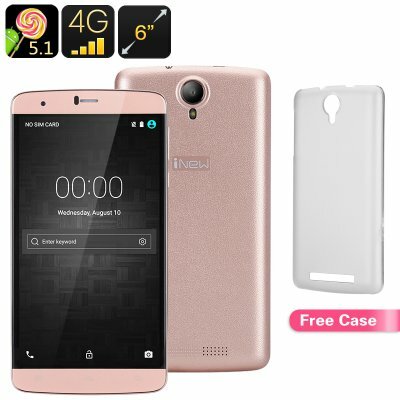 The iNew U9 Plus smartphone comes with a 12 months warranty, brought to you by the leader in electronic devices as well as wholesale China Smartphones..